Being a geek can often mean wondering weird things. Like, for example: How do the number of actors who have played the Doctor compare to the number of people who have walked on the Moon? And how do the surviving members of each stack up over the years? Some notes: There are 13 people listed as playing the Doctor. This is because: 1) Even though Peter Capaldi hasn’t made his Doctor Who debut, I’ve included him and 2) According to Wikipedia, the first Doctor was both played by both William Hartnell and, for The Five Doctors, Richard Hurndall. I’m not counting "alternate" Doctors such as the classic series’ Valeyard or the new series’ Doctor-who-wasn’t-worthy-of-being-called-Doctor (played by John Hurt). The dates for who landed on the Moon when and who played the Doctor when all came from Wikipedia. As you can see, when Peter Capaldi takes over the role later this year, the number of Doctor actors will top the number of Moon walkers for the first time since 1968. 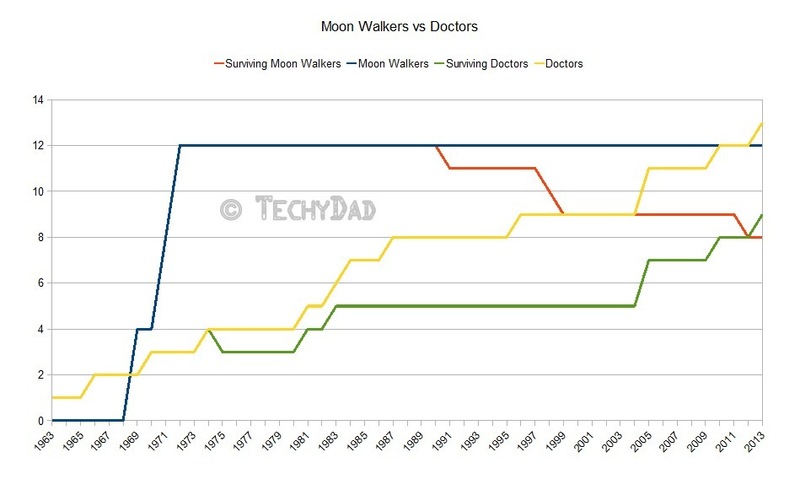 Furthermore, unless one of the former Doctor actors passes away before the end of the year, the number of surviving Doctors will surpass the number of surviving Moon walkers. Here’s hoping that we can increase the Moon walkers total soon – though I won’t be holding my breath.